Do Your Vehicle Need a Suspension Repair? Vehicle collisions, even minor ones, can often cause more damage than what is visible to the naked eye. During collisions it’s common for a vehicle to sustain damage to its suspension and steering systems. When the suspension is off on your vehicle, you lose the control you usually have while driving – compromising not only your safety, but also that of other drivers on the road. Our expert technicians can perform your suspension repair and get you back in control in no time. Whether you’ve been in an accident, or if your suspension has just undergone normal wear and tear, don’t risk causing even more damage to your vehicle. 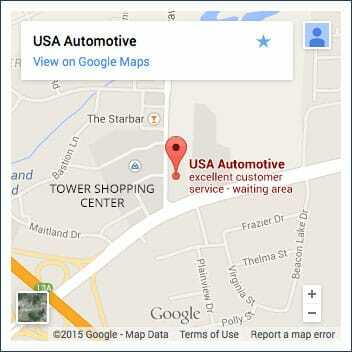 Bring your car to USA Automotive in Raleigh, NC and have it evaluated by a skilled team of suspension repair experts. Your car’s suspension and steering systems are what keep it driving smoothly – and when they aren’t working properly, you and your passengers are in for a bumpy ride. If you’re hearing noise when you drive over bumps or experiencing other problems like vehicle bouncing or hard turning, it’s likely that a faltering steering and suspension system are to blame. At the first sign of trouble, bring your car to USA Automotive. Our team of ASE Certified expert mechanics will perform a complete inspection of your car, including assessing its front end, rear end, shocks, struts and more. We have the tools and training to perform suspension repair services for cars, trucks and SUVs of all makes and models. Furthermore, we stand behind our suspension repair work with a 3 year/36,000 mile warranty – so you can get back on the road with peace of mind. We’re not only passionate about providing high quality auto repair service; we also work hard to provide you with the best customer service in Raleigh, NC. We know that auto repairs can come up unexpectedly, and are often stressful and interrupt your busy day, which is why our goal is to make your experience at USA Automotive as quick and easy as possible. Feel free to call us at 919-249-5295, or just stop by the shop – our friendly staff is available to help you with any questions or concerns you have about your vehicle. For your convenience, we also offer a 24/7 online appointment request form. Thank you for choosing USA Automotive for your suspension repair, and we look forward to serving you!